Belden 18/6 Riser-rated security and alarm cable has gray PVC jacket to withstand harsh environmental conditions. The bare copper cable has polyethylene insulation that resists electrical leakage and offers protection against environmental threats. It has current rating of 3.5-Amps and voltage rating of 300-Volts. This cable of diameter 0.22-Inch, has bend radius of 2.125-inches. It has 24 pF/ft conductor-to-conductor capacitance and 6.5-Ohm/1000-ft resistance. This cable withstands temperature range of -20 to 75 deg C. It is suitable for commercial applications. 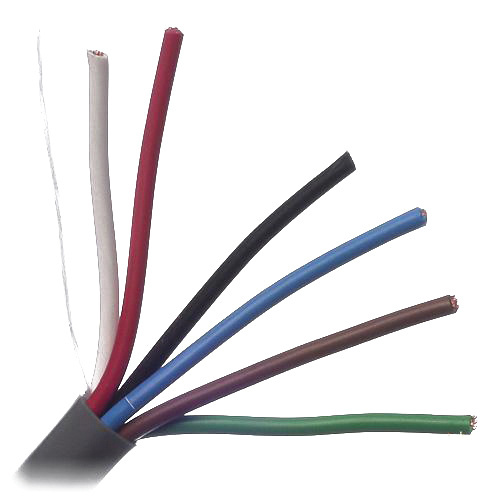 Cable is UL listed, CE marked, CSA certified, RoHS compliant and meets NEC, EU Directive 2011/65/EU standards.